USB Type B connectors, officially referred to as Standard-B connectors, are square in shape with either a slight rounding or large square protrusion on the top, depending on the USB version. USB Type-B connectors are supported in every USB version, including USB 3.0, USB 2.0, and USB 1.1. A second type of "B" connector, called Powered-B, also exists but only in USB 3.0. USB 3.0 Type B connectors are often the color blue while USB 2.0 Type B and USB 1.1 Type B connectors are often black. This is not always the case because USB Type B connectors and cables can come in any color the manufacturer chooses. 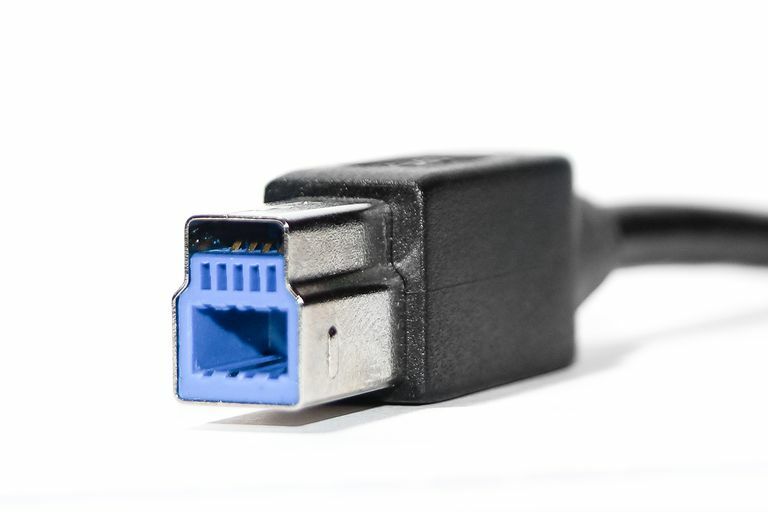 A male USB Type B connector is called a plug while a female connector is called either a receptacle (as used in this article) or port. USB Type B receptacles are most commonly seen on larger computer devices like printers and scanners. You'll also sometimes find USB Type B ports on external storage devices like optical drives, floppy drives, and hard drive enclosures. USB Type B plugs are typically found at one end of a USB A/B cable. The USB Type B plug fits into the USB Type B receptacle on the printer or another device, while the USB Type A plug fits into the USB Type A receptacle located on the host device, like a computer. The USB Type B connectors in USB 2.0 and USB 1.1 are identical, meaning that the USB Type B plug from one USB version will fit into the USB Type B receptacle from both its own and the other USB version. USB 3.0 Type B connectors are a different shape than previous ones and so the plugs do not fit in previous receptacles. However, the new USB 3.0 Type B form factor was designed in such a way to allow previous USB Type B plugs from USB 2.0 and USB 1.1 to fit with USB 3.0 Type B receptacles. In other words, USB 1.1 and 2.0 Type B plugs are physically compatible with USB 3.0 Type B receptacles, but USB 3.0 Type B plugs are not compatible with USB 1.1 or USB 2.0 Type B receptacles. The reason for the change is that USB 3.0 Type B connectors have nine pins, several more than the four pins found in previous USB Type B connectors, to allow for the faster USB 3.0 data transfer rate. Those pins had to go somewhere so the Type B shape had to be altered somewhat. There are actually two USB 3.0 Type B connectors, USB 3.0 Standard-B and USB 3.0 Powered-B. The plugs and receptacles are identical in shape and follow the physical compatibility rules already outlined, but USB 3.0 Powered-B connectors have two additional pins to provide power, for a total of eleven pins. If you're still confused, which is completely understandable, then see our USB Physical Compatibility Chart for a graphical representation of physical compatibility, which should help. The mere fact that a Type B connector from one USB version fits in the Type B connector from another USB version doesn't imply anything about speed or functionality. What Is a USB Type A Connector?